[GEORGE DEWEY]. Printed Document. 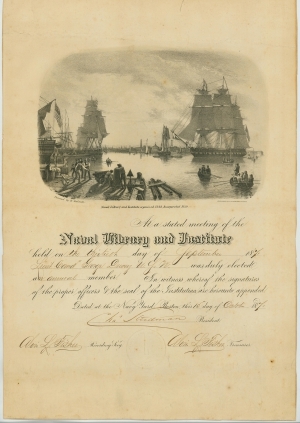 A lithographed membership certificate to the Naval Library and Institute. Signed by Charles Steedman, President, & witnessed twice by Oliver L. Fisher. Navy Yard, Boston, Mass October 15, 1871. 11½ x 16½ in. At a stated meeting of the Naval Library and Institute held on the thirtieth day of September 1871 Lieut Comdr George Dewey, U. S. N. was duly elected an annual member. In witness whereof the signatures of the proper officers & the seal of the Institution are herunto appended. Admiral George Dewey was the only person in the history of the United States to have attained the rank of Admiral of the Navy, the most senior rank in the United States navy.